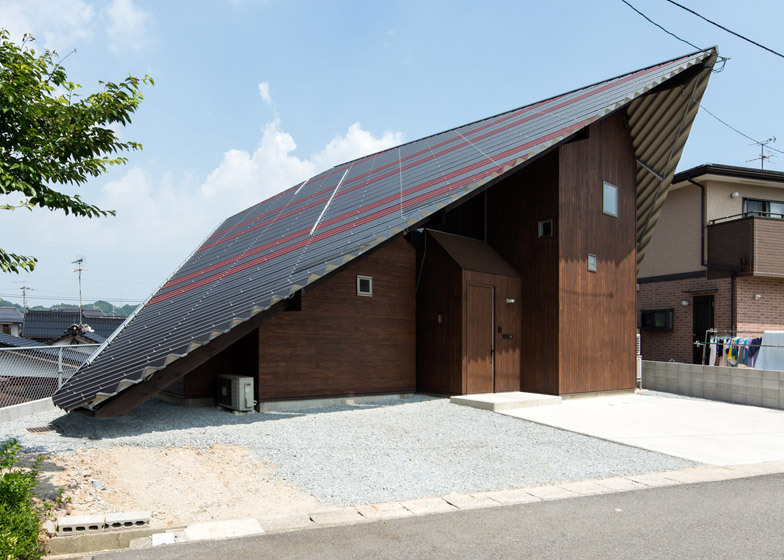 Seven house-shaped blocks are sheltered beneath the large asymmetric roof of this house in Japan by Y+M Design Office (+ slideshow). 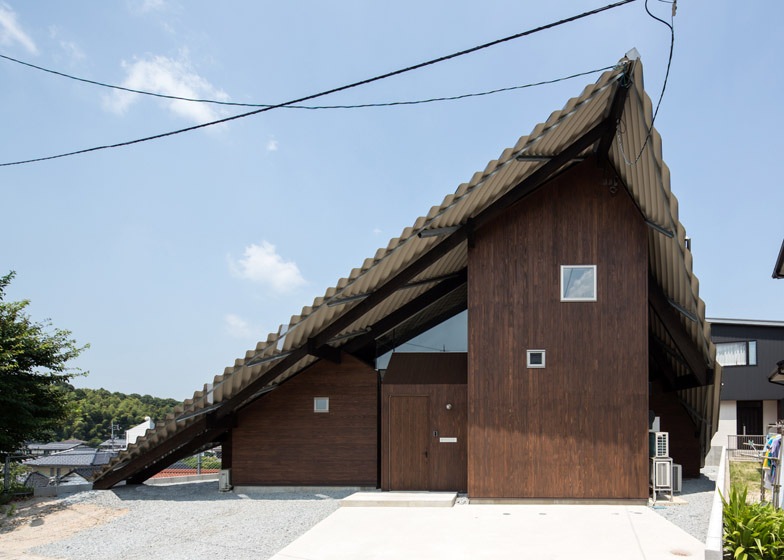 Japanese firm Y+M Design Office designed Rain Shelter House to accommodate three generations of a family based in Yonago, a city in Japan's Tottori Prefecture. 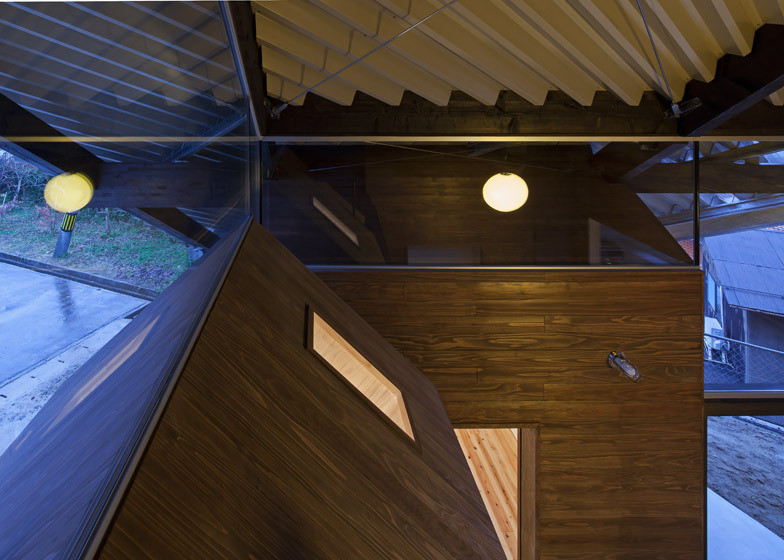 To give personal space to all five family members, the architects conceived the building as a cluster of small blocks – creating a makeshift village united under a single roof. 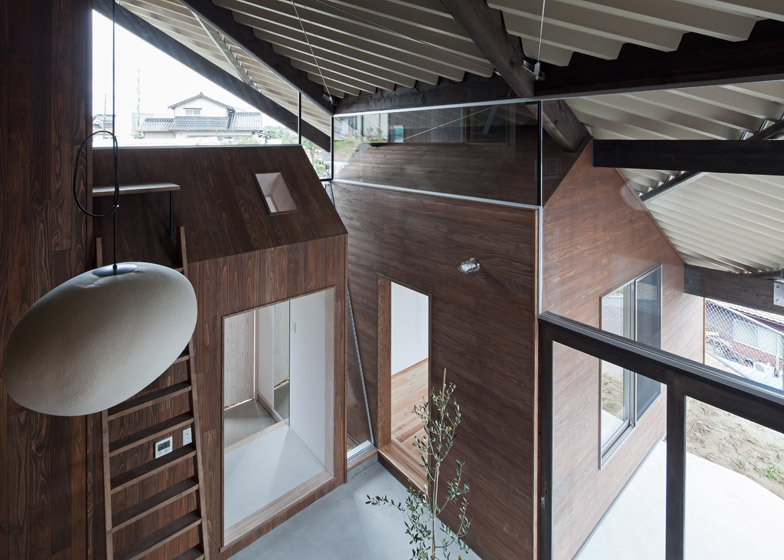 "We planned a divided house," said the architect team, whose recently unveiled projects also include a two-layered house in Tokushima. 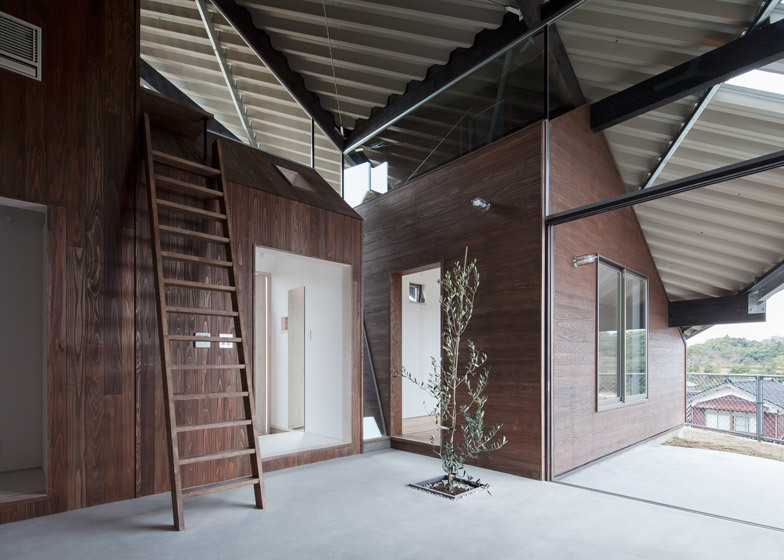 "This architecture keeps adequate privacy among the family. And some of the residents can sleep without any concern for the disturbing noise of the other family members after night-shift work," they said. The large folded roof covers all seven blocks, frames an open-air living space at the centre of the plan, and shelters both a terrace and the main entrance. It also extends down to meet the ground level on the southern side of the building, helping to block direct sunlight during the peak of summertime. "The roof keeps off rain throughout the year, the chilly north-west wind and snow in winter, and the strong afternoon sunlight in summer. And it can keep the client's privacy from neighbour houses," said the team. 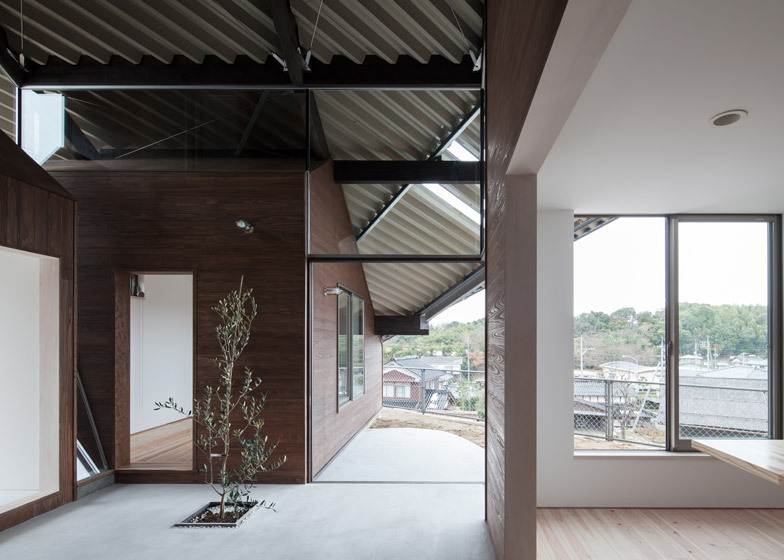 Narrow strips of glazing allow limited amounts of light to filter through the roof's corrugated surface. Other glazed sections in the facade allow the communal living space to be closed off from the elements when required. Three of the blocks are two storeys high, while the other four are single storey. The largest accommodates a kitchen and dining area on the ground floor, with two children's rooms above. These are accessed using a staircase contained within another of the two-storey blocks. 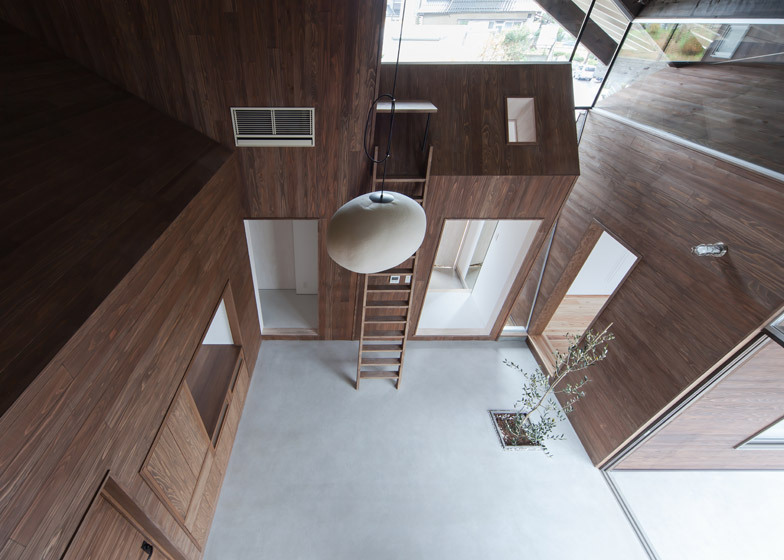 The third features a ground-floor bathroom, a top-floor study and a ladder leading up to it. The four single-storey blocks house two bedrooms, the entrance lobby and a group of utility areas. "People come and go between each 'divided house' and the living room, which is an open shared space for the family," added the designers. The building was fitted with under-floor heating to keep the interior warm at night and a fan that is activated by a thermal sensor. 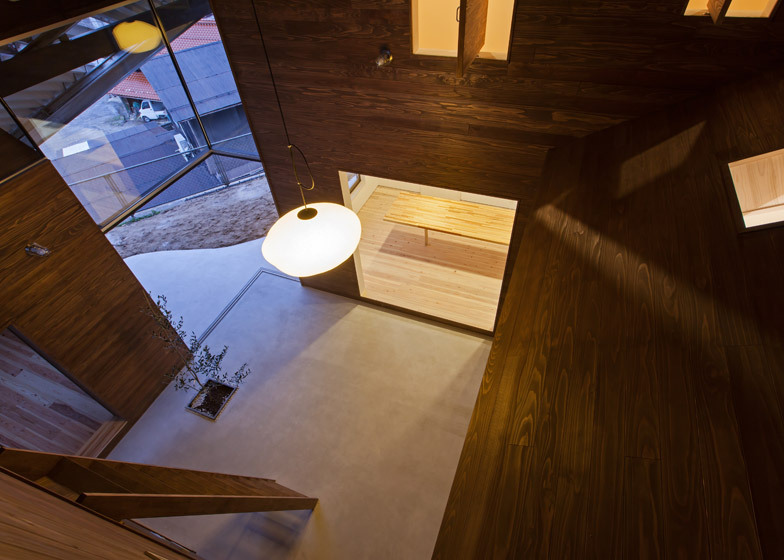 Wood was used to provide both the structural framework and the walls.